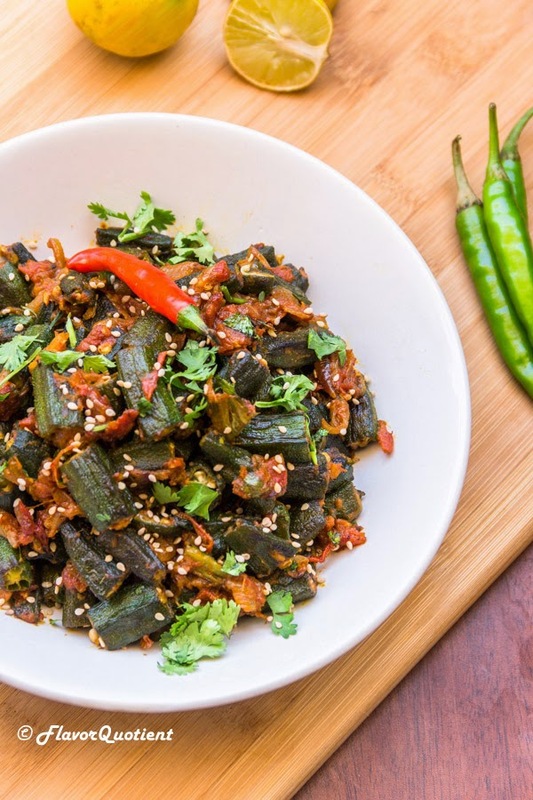 The not-so-loved okra has got all the make-over in this recipe to get at its best with the flavorful Indian spices! I told you in my last post that I am playing safe, didn’t I? And I proved it again! You may not like okra because of its laces and I can’t blame you. That’s a not-so-loving characteristic of okra anyway. But before cooking, if you wash and dry them using a kitchen towel, they will get a lot better. I discovered this recipe on Youtube and after I made it for the first time, it took a permanent place in our weekly menu. This is minimal fuss dish which I love to cook on weeknights. 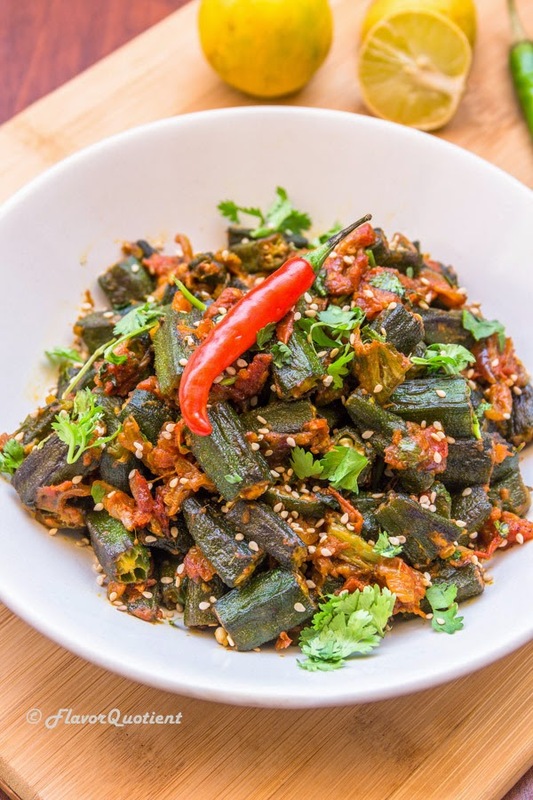 You must make this once and trust me this crispy green veggie won’t disappoint you this time! Cut the okra into 1 inch long pieces. Heat 2 tablespoons of oil in a frying pan and add mustard seeds to it. Add okra and stir well. When the okra is fried and cooked, take them out and set aside. Next heat the remaining oil. Add ginger paste, garlic paste and chopped onions and sauté for few minutes. When the onions become translucent and soft, add chopped tomatoes. Stir well to combine everything. Next add the powdered spices – turmeric, red chilli, cumin, coriander and raw mango powder. Mix well. Sauté for a couple of minutes and then add garam masala & salt to taste. Cook till the tomatoes are nice and soft. Then add coriander leaves and stir well. Tip in the fried okra to the onion and tomato mix. 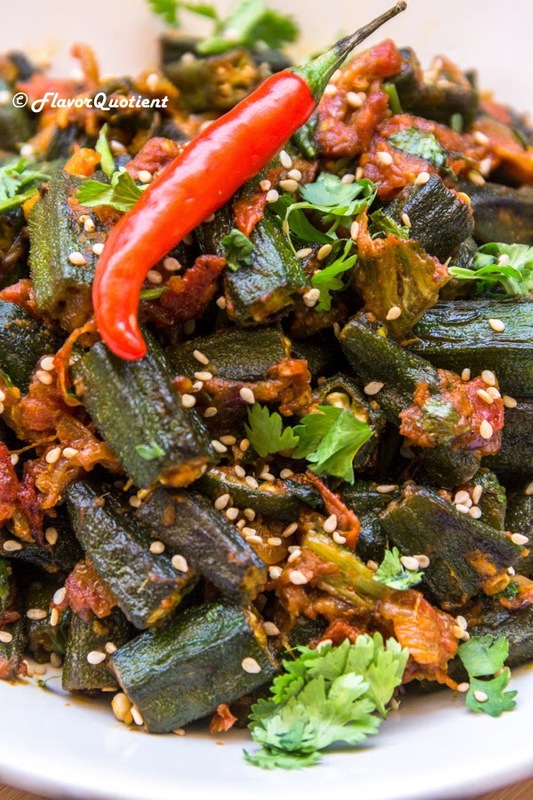 Toss the pan to coat all the okra with the spices. Adjust the seasoning if needed. 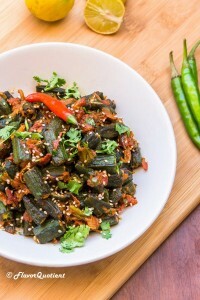 Garnish the spicy okra with sesame seeds and serve hot with roti or any kind of Indian flatbread.